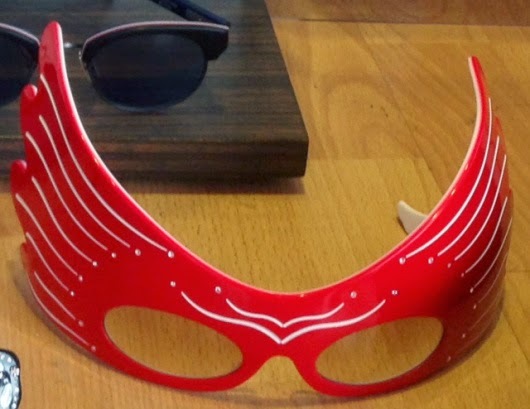 Wow, I love these glasses--red, big, and with wings! Maybe that's the point for many people--to stand out! Being 1 of 7 billion people is not very satisfying--so how do we differentiate ourselves? This is something that we all struggle with as human beings--what is a life of purpose, meaning and how do we know that we've achieved it? Down in Florida, I see so many "haves" and "have nots"--but it's not enough for the haves to have, but if they aren't showing it off, getting stares, having people talk about them, then they seem to feel uncomfortably ordinary. What is this disease of the ordinary that people must ever run to escape from--and even with the reddest, wildest, wing glasses or whatever--will they ever feel truly happy and satisfied inside?